As this blog deals mainly with things that happened in the 1930s and 1940s, many of the emails and telephone conversations I’ve had with people visiting it have been with a “then” and “now” perspective. Many things were different of course but the one thing that stands out for most people is the strong family life that existed in the 30s and 40s. It was accepted that the family was the building block of society which enabled positive progress to be made within a society, a country or the world at large. Today’s economists and politicians pay lip service to the family and then proceed to attack it in so many ways. It is estimated that, in the UK today, one quarter of the population live on their own. Such was not the case in the 30s and 40s. Today many reasons are put forward for the break up of families, the obvious one being easy divorce, but I think one reason, which often gets away with it, is the advent of central heating. When I lived at Wern Terrace in Pontypool from 1929 to 1937 we had just one room which was constantly heated and that was what we called “the kitchen” or “the living room”. Dining rooms weren’t in vogue then. Everyone wanted to keep warm, particularly in the very cold winter weather, so that we ate, played, listened to the wireless, worked and chatted in the one room. The family stayed together and when the meals were served we all sat around the table and talked; thus we learned how to handle cutlery, pass food to others and talk about school and other things that might have happened during the day. Children did not have “their own room” which was centrally heated and where they could watch television or play computer games on their own. When it was bedtime we warmed our pyjamas in front of the fire, put them on and then dashed upstairs into a cold bed or one that had been warmed in places by a hot water bottle or a warm brick wrapped up in a piece of flannel. There were fireplaces in some of the bedrooms and also in the “front room” or “parlour” but the bedroom fires were hardly ever lit and the parlour was treated to some warmth only on some Sundays or when visitors were expected such as at Christmas time or birthdays. 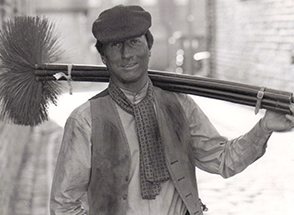 Because the large main fire would consist almost entirely of coal, a lot of soot gathered in the chimney so that every year or so we had a visit from the sweep who would clean the soot out with his long round brushes. If this wasn’t done on time there was a danger that the chimney would catch on fire and flames and soot would start pouring out of the top of the chimney. 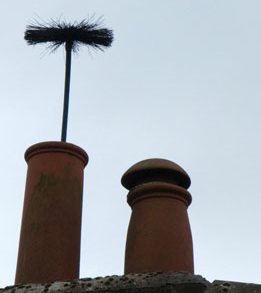 When the sweep visited us at Wern Terrace, one of our jobs would be to stand in the garden and shout when we saw the brush emerge from the top of the chimney. The sweep would then know he could push his brush up and down and gather the soot in the grate at the back of a tarpaulin sheet which prevented the soot billowing out into the room. I well remember one occasion when we were doing this job; the sweep had put on what he thought would be enough rods to get his brush to the top. We couldn’t see it emerge so we shouted that the brush hadn’t come out yet. The sweep put on another rod but still no sign of the brush. He put on another and another and still – no brush. The sweep simply could not understand it. While he was puzzling over this my mother happened to go upstairs into the bedroom used by her and my father in the front of the house. On the inside wall of that bedroom, several feet up from the floor was a small metal inspection cover which gave access to the chimney. The sweep’s brush had knocked off this cover and the brush, covered with black soot, had wandered over to the other side of the bedroom in a large arc spreading soot all over the bed and everything else in the room. My mother was devastated and had to set about cleaning up the biggest mess I’d ever seen. A year or so later we moved to Garfield in School Lane. The heating arrangement was marginally better there as we had one of the new immersion heaters which provided the luxury of a tap which actually provided hot water; also the storage tank was in the double bedroom which I shared with my brother Garyth. We both revelled in our centrally heated bedroom. But my eldest brother, John, had the single bedroom at the front of the house which overlooked the school field and allotments. Consequently, in the very cold winter weather, my mother used to use one of the black valor oil heater for an hour or two in John’s bedroom before he went to bed. Valor oil heaters could be temperamental and, if the wick was not trimmed carefully, it smouldered instead of burning and gave off black oily smoke. On that day that was just what happened so that, when my mother went to the bedroom to put out the heater, everything, bed, furniture, walls and ceiling, were covered with a black oily deposit. My mother had a worse job than she did with the soot. I suppose we are saved from such catastrophes by today’s central heating, but, as far as a cohesive family life is concerned, there’s a price to pay. I’ve had a number of emails from visitors to this blog who have discovered information and pictures about their family. A lot of people these days are scouring the internet looking for such information and many have discovered this blog quite by accident when engaged in this activity. The Pearce brothers were well known and active in the Pontypool area over 70 years ago so I am publishing below an article about them which appeared in the Weekly Argus of 26th July 1941. 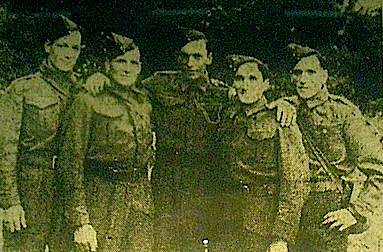 “Five Pontypool brothers known in South Wales athletic circles as “The Pearce Brothers”, are serving in the Home Guard. They stick by each other in all they do. “They were all educated at the same school, work in the same colliery and live within a radius of half a mile of Upper Race, Pontypool. They are seldom separated by any great distance, go about together and find brotherly tolerance second nature to them. “Known to many as “The Inseparables”, John, Will, James, George and Bert Pearce are the sons of Mr and Mrs R. Pearce of Race House, Pontypool. Their ages range from 24 to 36. Before they went to work underground at Glyntillery Colliery they were educated at Pontymoel School. “James, the third brother, who ran for Wales in the 1938 cross country championship in Ireland, told a South Wales Argus reporter other interesting facts. The brothers all work the day shift in the colliery where they are employed as miners, and when they hew the coal out of the mine they are never separated by more than three-quarters of a mile. “Eldest brother is John aged 36. He was 31 before he took up running. At Newport he won two non-harriers events. He is also a pigeon fancier. “Will, aged 34, is secretary of the Upper Race Pigeon Club. James, 32 lives with his parents. George 28 likes to be known as ‘just one of the crowd’. Bert is 24 and has won many racing events in the Eastern Valley. “Mrs Pearce is proud of her sons. ‘They never have a cross word’, she says. Visitors to this blog will be well acquainted with the murder of Dripping Lewis in Pontypool and will have seen the accompanying photographs. You will also have seen the information about the book “Who Killed Dripping Lewis?” by Monty Dart. I have to thank Monty for alerting me to the following article in the South Wales Argus. Residents of Pontypool might possibly see some of these activities going on. PONTYPOOL could be turned into a life-size version of Cluedo with participants trying solve a real murder. The idea is the brainchild of three photographic art students, Lauren Clithero, Rebekka Gill and Jodi Westmacott, who study at Newport University. They submitted their idea for review, after 43 students were commissioned by Torfaen County Borough Council to create artwork as part of the Townscape Heritage Initiative (THI). Miss Clithero, 21, and her two class mates thought about using the murder mystery game, after hearing of the unsolved Pontypool murder of William Alfred Lewis in 1939. Miss Clithero said: “Author Monty Dart wrote a book last year called Who Killed Dripping Lewis? In the girls’ game, eight participants would sign up and be given clues that will lead them around the town, where Mr Lewis had been seen before his murder. Actors would be in place to hand out clue cards and objects found at the murder scene to the players at key locations, and slowly the team would work out which one of them could have been the murderer. Back in 1939, Mr Lewis’s body was discovered by builder Thomas Brimble, who had been carrying out building work for Mr Lewis. The blood-soaked body, which had received repeated blows to the head, was laying across the bed in his house. He was a rich bachelor who owned approximately 200 houses in the Pontypool area. Initial investigations led nowhere and four detectives from Scotland Yard were called in. Despite interviewing hundreds of people the police got nowhere. The students have pitched their ideas to a panel of judges who will decide which projects to take forward later this month.